Despite the cold, a chance to view the shimmering northern lights coaxed this skygazer onto the frozen surface of Lake Superior on the west coast of the Keweenaw Peninusla and offered this nocturnal crescendo as a reward. 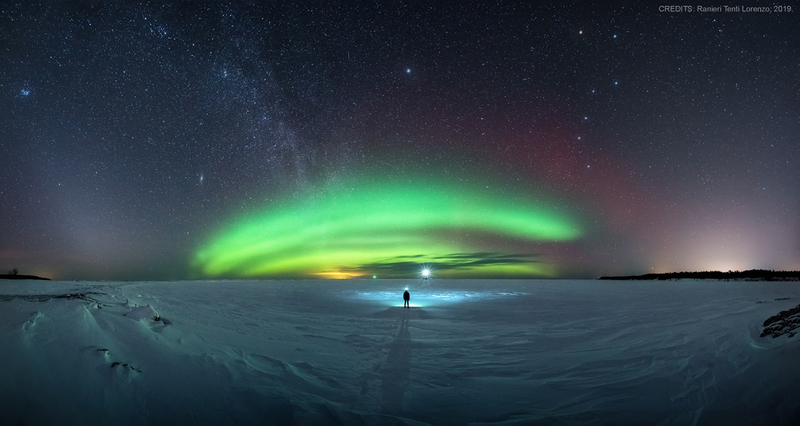 A northern late winter night sky also plays across the panoramic composition of images made between 10pm and 1am on the night of February 28/March 1. At left, a faint band of Zodiacal light rises sharply from the horizon crossing Mars and the Pleides star cluster. Both the distant galaxy M31 and our own Milky Way shine above the greenish auroral arc. Navigational north pole star Polaris is centered above and accompanied on the right by the northern night’s most recognizable asterism, the Big Dipper. Terrestrial lights include markers for two breakwaters on the the horizon near the center of the scene. Posted on Friday, 22 March 2019 by VGC	This entry was posted in ifttt-photograph and tagged IFTTT, NASA. Bookmark the permalink.